So, the owl just appeared at your house. It dropped off that letter that you've been feverishly waiting for. You're in. Just like Harry Potter. Hogwarts awaits you in the near future, so you pack your bags and wait patiently at the 9 3/4 stop so you can ride the train to campus. Then it hits you. What house will you be sorted into? "Please, please let it be Gryffindor!" you might be whispering to yourself. After all, you want to be in the house that has the best Quidditch team. You want to be a part of the House that brought the world Harry, Ron, and Hermione. And you definitely don't want to be a part of Slytherin, the house most well-known for how many evil wizards that it produced. When you step up to the hat, what will it say? Well, we imagine it couldn't hurt for you to wear this Gryffindor pin to the sorting har to give a subtle hint at the right choice. 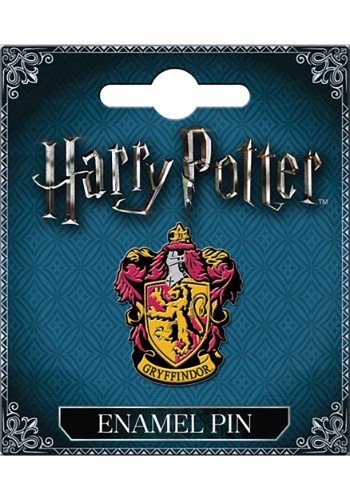 This Harry Potter Gryffindor pin is an enamel pin licensed from the Harry Potter series. It has the Gryffindor House crest on the front and a simple tack pin in back. You can wear it on your everyday clothes, add it to your Harry Potter cosplay costume, or use it to spruce up your backpack. The choice is up to you! Be sure to check out all of our Harry Potter pins! they're a great gift for any true Potter-head and we carry all of the major Hogwarts House!